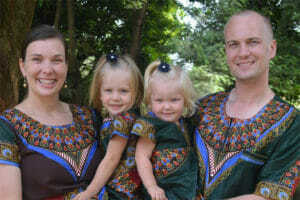 Elliot and Serena Derricks are missionaries serving as Bible translation and literacy advisors with Lutheran Bible Translators. They arrived in Cameroon in March 2018 after doing graduate studies in linguistics, translation, and literacy at GIAL in Dallas, Texas. Elliot and Serena are currently working on language learning – first French, the language of wider communication – and then their project language. Their mission is to work alongside a local language group that doesn’t have the full Bible in their language, revising their New Testament, translating the Old and increasing literacy rates community-wide. Elliot grew up on a dairy farm in Denmark, Wisconsin, where he learned about hard work, diligence and developed his love for the outdoors. After many short-term trips to Mexico while at Concordia University Wisconsin, he felt a call to long-term missions. Serena spent her childhood riding horses in her hometown of Buckley, Washington. She felt God calling her to be a teacher in the 6th grade, which eventually led her to the mission field after graduating from Concordia University Portland. Before beginning service with LBT, the Derricks served in various fields with LCMS International from 2010 – 2016, including Slovakia, Macau, and South Korea. They welcomed their beautiful daughter, Lydia, in March of 2015 in Seoul, South Korea. Their second daughter, Josephine, joined the family in January 2017 in Dallas, Texas. While serving overseas, Elliot and Serena witnessed first-hand the importance of knowing the people’s heart language in order to effectively communicate God’s love to them. These experiences provided God an opportunity to place a passion for Bible translation in their hearts. Please pray for them as they serve with LBT and prepare to bring God’s Word to those who do not yet have the Bible in their heart language. LBT is seeking Lutherans to serve overseas through the ministry of Bible translation and Scripture engagement. If you feel that God may be leading you towards missions or if you wish to make donations to a missionary, LBT may have a place for you. The minimum project goal has been met. Donations are still being accepted for this project. Cars and trucks are far from “affordable” in Cameroon. Can you imagine having to pay $50,000 for a truck that only costs $35,000 in the USA? And can you imagine having to pay another 100% of the vehicle price in taxes? That’s everyday life in Cameroon. Reliability is key. Reliable can also mean the difference between life and death when you are far away from medical assistance. It is extremely difficult to find a reliable used vehicle. While you may find a good mechanic in Cameroon, it is very hard to find a vehicle that has been well maintained. But it isn’t just basic maintenance like the lack of oil changes that are hard on a truck. Running year after year on rough roads shakes a vehicle to death. Expensive? Unfortunately yes. Excessive? Absolutely no.